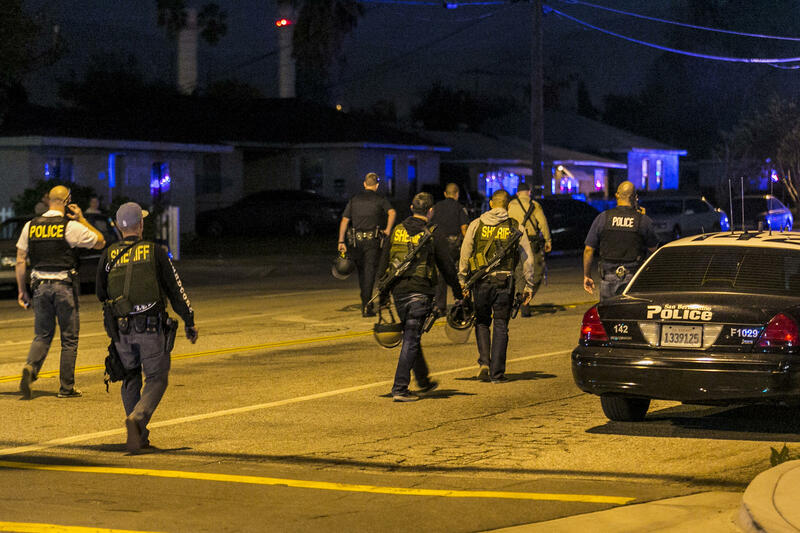 Police officers line the street outside a suspect's home in Redlands, Calif., on Wednesday. Law enforcement officers in San Bernardino killed two people suspected of killing 14 people and wounding 17 others in a shooting at the Inland Regional Center earlier on Wednesday. 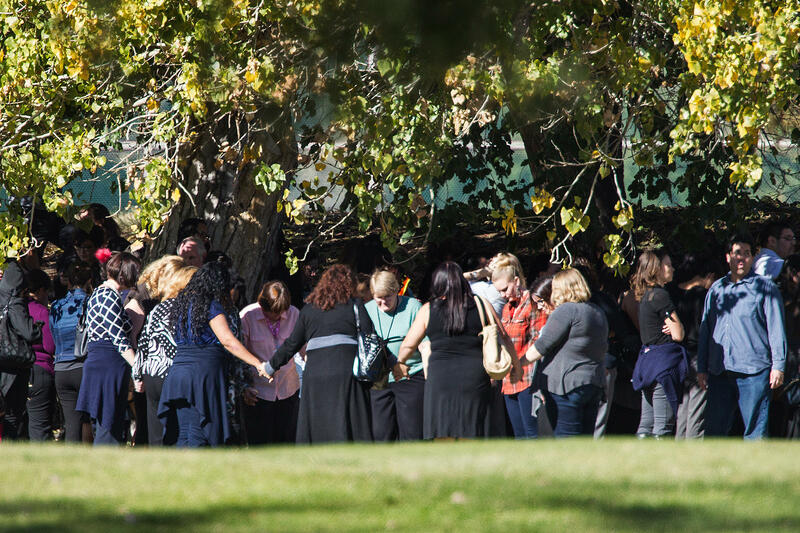 Evacuated workers pray in a circle on the San Bernardino Golf Course across the street from the scene of the shooting. Employees and other people are evacuated by bus from shooting site. 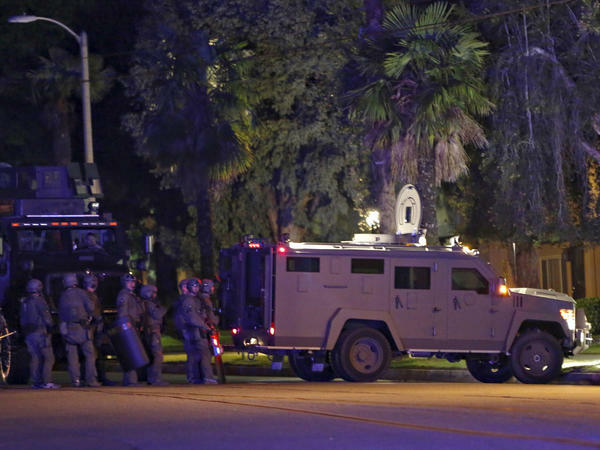 Multiple fatalities were reported as authorities searched for up to three suspects. San Bernardino Police Chief Jarrod Burguan says the suspects fled in a potentially dark-colored SUV. 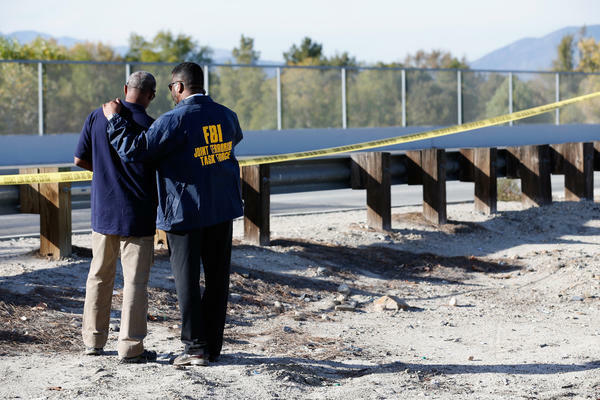 Members of the FBI Joint Terrorism Task Force stand near the site of a news conference following the shooting. 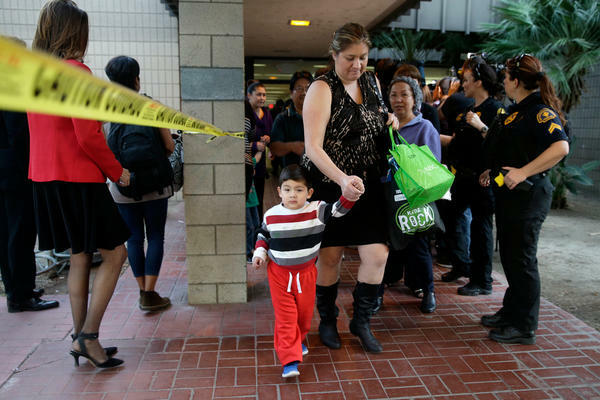 People taken from the Inland Regional Center after the shooting walk from buses (right) into The Rock Church and World Outreach Center. Marie Cabrera, Sonya Gonzalez and Christine Duran, all of San Bernardino, pray after the shooting. An aerial photo shows police vehicles surrounding and searching a bullet-ridden SUV in San Bernardino. People exit a community center to be reunited with friends and family after a shooting that killed multiple people at a social services center. Authorities guard the perimeter near the location of the mass shooting in San Bernardino. Police Chief Jarrod Burguan said one man and one woman were killed when police chased the suspects' SUV and exchanged fire. 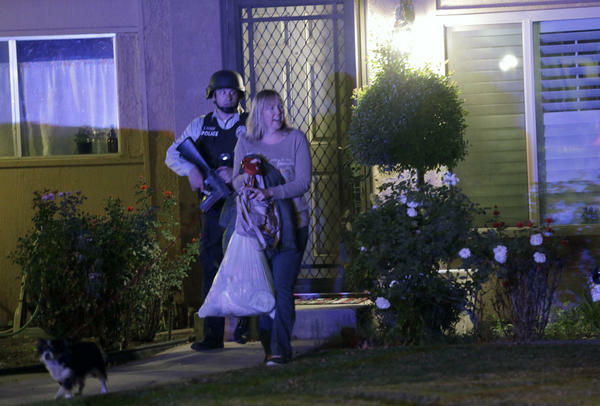 A police officer escorts a woman from a home in Redlands, Calif., following the shooting in San Bernardino. Police officers line the street outside the house of one of the suspects in a mass shooting in Redlands, Calif., following a shooting that killed 14 people and wounded 17 others in San Bernardino on Wednesday. 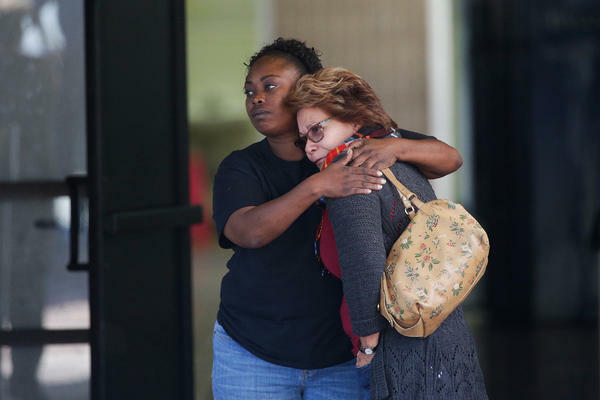 Two women embrace at a community center where family members gathered to pick up survivors after the shooting. 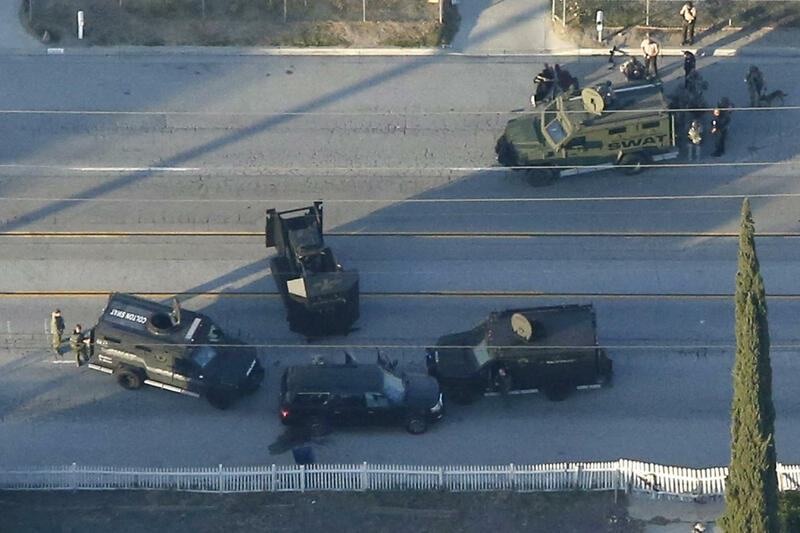 Two suspects died in a gunfight with police after a mass shooting in San Bernardino, Calif., on Wednesday. The attack at a county employee holiday party at the Inland Regional Center left 14 people dead and 17 others wounded. San Bernardino Police Chief Jarrod Burguan said Syed Farook, 28, an American citizen, and Tashfeen Malik, 27, were killed when police chased the suspects' SUV and exchanged fire. Law enforcement sources confirm to NPR's Dina Temple-Raston that Farook was employed by the San Bernardino County health department as an environmental health specialist. His name has also been reported as Sayed Rizwan Farooq. A source tells Dina that witnesses appeared to recognize his voice and build even though he was wearing a ski mask. His brother, a source told Dina, is also a subject of the investigation. "We followed up on some tips that took us to a residence in the city of Redlands," Burguan said. "When officers were setting up on that residence to watch it, there was a vehicle that was seen leaving that was suspected of being involved. There ended up being a pursuit ... the suspects' vehicle stopped and there was an officer-involved shooting." Burguan said the man and woman were dressed in "assault-style clothing" and carried "assault-style rifles" and handguns. 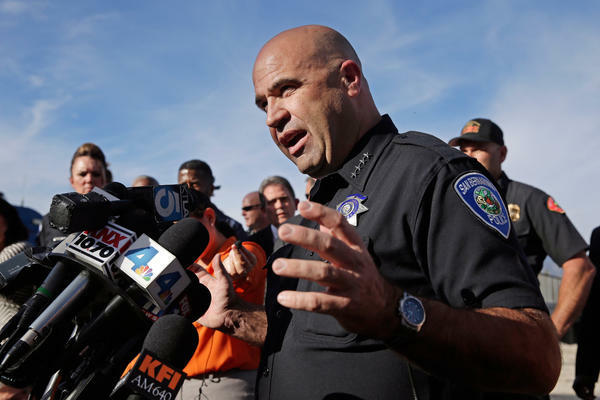 At this point, Burguan said, authorities were confident that the two were the only shooters at Inland Regional Center. Burguan also said police detained a third suspect who was seen running away, but they do not yet know whether he was involved. He said one police officer sustained non-life-threatening injuries. 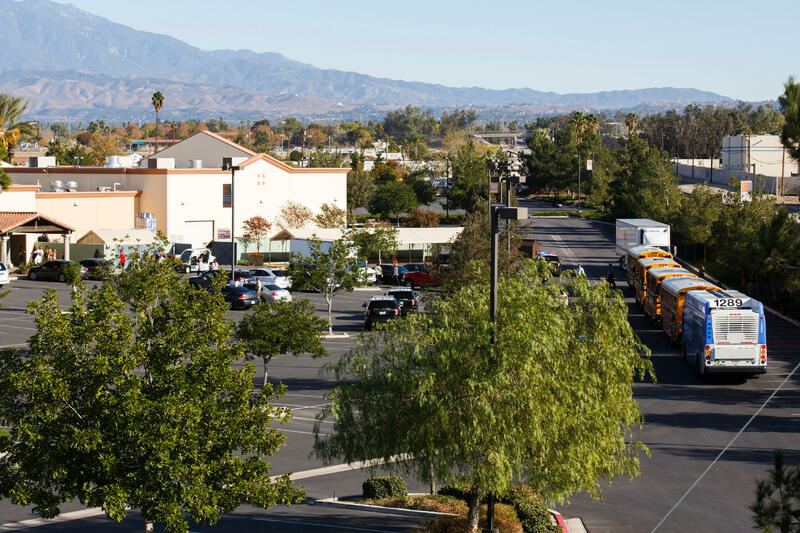 At least 14 people were killed and 17 others wounded when the two suspects, armed with .223-caliber assault rifles and semiautomatic handguns, entered the Inland Regional Center and began shooting, authorities said Wednesday. The facility is part of the California Department of Developmental Services, and serves people with developmental disabilities. 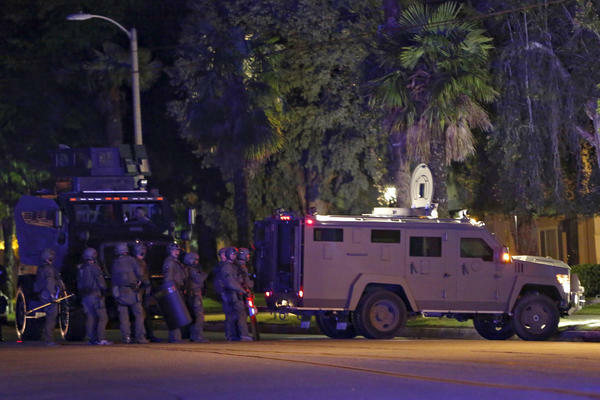 Farhan Khan, the brother-in-law of Syed Farook, appeared at a press conference held by the Los Angeles Chapter of the Council on American-Islamic Relations, where several regional Islamic leaders denounced the attack and said it was against their religion. "I just cannot express how sad I am for what happened today," Khan said. "My condolences to the people who lost their life. ... I am in shock that something like this could happen." Khan said he last spoke to Syed about a week ago. "I have no idea why would he do that, why he would do something like this," he said. "I would say hi and bye, but we never engaged him in conversation. He didn't say much at all." Chief Burguan said late Wednesday that authorities still were not comfortable pinpointing a specific motive, although he did say that there had been some sort of dispute at a the holiday party, after which Farook left the gathering and returned with guns. Burguan said terrorism was still a possible consideration. Despite reports of a dispute spurring the attack, Burguan said it didn't appear to be entirely spur-of-the-moment. "Based upon what we have seen and based upon how they were equipped, there had to be some degree of planning in this," he said. Burguan said that several hundred people who were in the building at the time of the shooting were taken to a safe location and that buildings in the surrounding area were locked down. 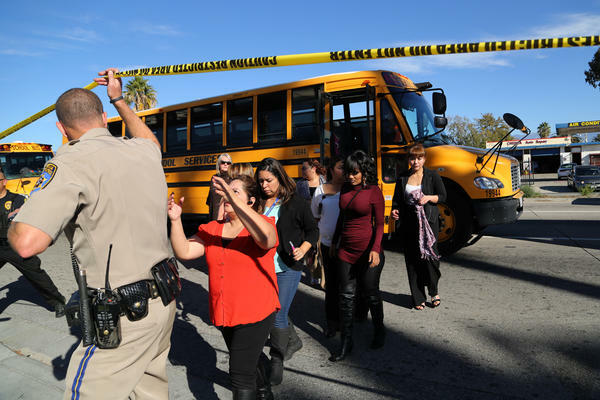 Roads near the scene were shut down and the San Bernardino County Sheriff's Department warned people to avoid the area. Terry Petit said his daughter works at the Inland Regional Center and that she said she was inside when the sound of gunfire erupted. He choked back tears as he read her texts to ABC 7 Eyewitness News: "People shot. In the office waiting for cops. Pray for us. I am locked in an office." San Bernardino Mayor R. Carey Davis said in a statement that the community "experienced severe loss and severe shock" Wednesday. "It is critical in moments like these, our City unites in supporting the victims, their families, and the effort against crime in our City. We will continue to utilize all safety resources available to the San Bernardino community to deal with this tragedy," he said. 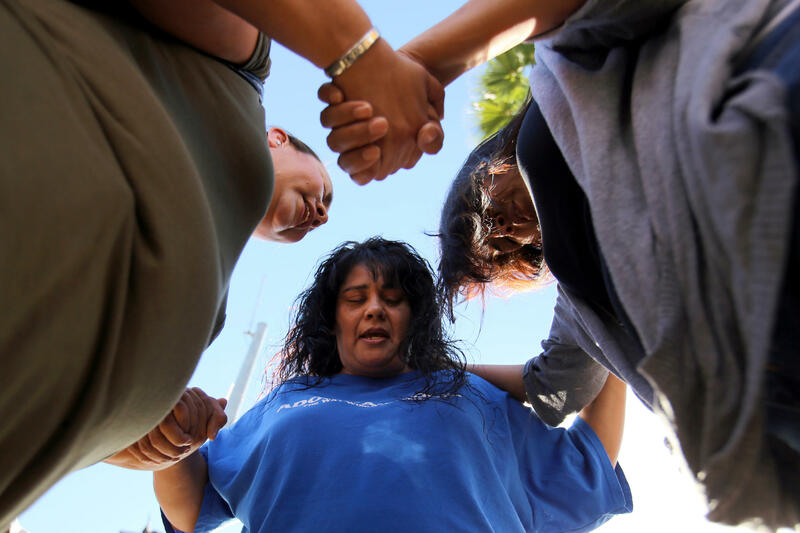 A White House official said that President Obama was briefed on the San Bernardino shootings. "We don't yet know what the motives of the shooters are, but what we do know is there are steps we can take to make Americans safer and that we should come together in a bipartisan basis at every level of government to make these rare as opposed to normal," Obama told CBS News on Wednesday. "We should never think that this is something that just happens in the ordinary course of events, because it doesn't happen with the same frequency in other countries."